Through an open curriculum and transdisciplinary approach, the master's program in Liberal Studies gives students the intellectual foundation for understanding the powerful ideas and forms of expression that create the backbone of the modern world. Based in the center of New York City, world-class faculty and committed students achieve an in-depth understanding of our global community and our broader place within it. Through the Liberal Studies program, you will critically explore and intensively examine the core issues of our time. 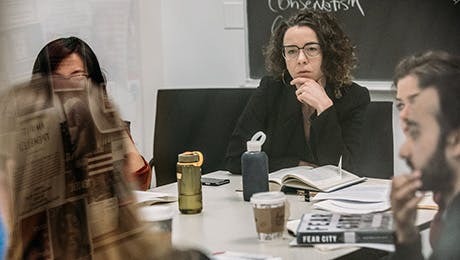 The MA in Liberal Studies offers practical writing tools and guided in-depth study in cross-disciplinary courses taught by renowned faculty, who share the values of rigorous critical inquiry and thoughtful expression. The program's core courses will ground you in the history of ideas and in the practice of sustained writing, while you develop an intellectual peer community. From there, you can branch out, taking advantage of the rich offerings and distinguished faculty of The New School. Work with both a faculty advisor and a student advisor to create a robust pathway tailored to your individual needs and academic ambitions. We offer a rich selection of courses with world-class professors who can extend your command of critical theory, the history of ideas, aesthetics, philosophy, politics, anthropology, media theory - wherever your curiosity takes you. Courses are available in both the daytime and the evening to fit into even the busiest schedule. At the heart of the program are two core courses. The first - The Making of the Modern World - considers the origins and fate of modern societies as understood by key thinkers who have explained and championed modern social developments, as well as those who have harbored grave anxieties about the shape of modern life. We cover significant currents in the arts, social history, cultural theory, literature, politics, and philosophy. Our second core course - the Master's Critical Writing Seminar - helps students work on nonfiction writing and criticism, so that they can better express their own views with clarity and force. Students often use this course to write the required MA thesis, exploring a topic of their choice in-depth and producing a substantive and polished work of prose. The Department of Liberal Studies offers a Master of Arts (MA) degree program. Liberal Studies combines the New School's tradition of critical and socially engaged inquiry with an interdisciplinary approach to problems in culture. We offer concentration and elective courses areas including critical media theory, criticism in literature and art, aesthetics, and gender.